I’m sure you have all heard it …“If you want to lose weight, you need to stop drinking alcohol” …but do you really understand why alcohol is of concern? Let me explain. Alcohol is broken down into acetate after it is consumed, which is basically vinegar. The body burns acetate before any other calorie consumed or stored, including fats and sugars. Like I have said before, calories are all the same, but by adding alcohol to your diet you are likely to consume more calories than you burn in a given day. When you drink alcohol your body is getting all of its energy from the acetate; therefore, the calories you don’t burn are likely to come from the Nutella you ate earlier or that Pepsi you had at lunch. Alcohol temporarily inhibits “lipid oxidation.” This simply means that your body can’t burn the fat already on your body as easily. 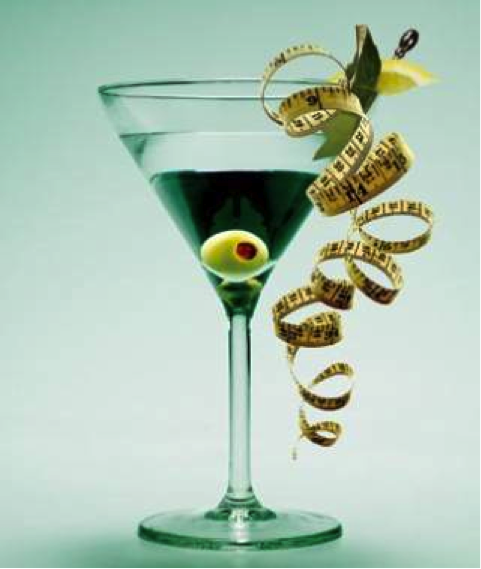 To sum things up, following a high-fat, high-alcohol diet will cause weight gain. That doesn’t mean that you can’t drink and lose weight. Remember: MODERATION IS KEY. Be aware of what and how much you are drinking. A margarita can have up to 700 calories, where a single glass of wine only has 70 calories. Drink water between drinks. Not only does this keep you from drinking too much, it keeps you hydrated helping you avoid a hangover the next day. Don’t skip out on exercise. A night of drinking can leave you too tired or hungover to exercise. Don’t give in! Practice self-control. If you tend to drink too much or overeat at parties, try eating a healthy snack beforehand. This keeps you from drinking on an empty stomach, which only speeds up intoxication.